Pretty Good Solitaire version 14.5 for Windows is available for download from http://www.goodsol.com/download.html . - Batsford Rush - Batsford with Gold Rush style redeals. The game is still challenging but the extra redeals make it interesting. - Blue Jacket - Virginia Reel with the ability to play cards to spaces in the reserves. - Cotswold - a variation of Gloucestershire. - Double Eight Off - a 2 deck version of Eight Off. - Double Stonewall - a 2 deck version of Stonewall. - Forty Four Thieves - a Forty Thieves variation with 11 tableau piles. - Jumping Spider - a new variation of Spider. - One Cell - FreeCell with only one cell. - Small Triangle - a one deck version of Hypotenuse, a Klondike variation. - Yucone - a cross between Yukon and Cone. A full list of all of the 850 games in version 14.5 is at http://www.goodsol.com/pgs . You can download Pretty Good Solitaire from http://www.goodsol.com/download.html . Or, if you have a previous version installed, you can run the game, go to the Internet menu, and select 'Download Latest Version'. Be sure to exit the game before you install. Version 14.5.0 is a free upgrade for users who originally ordered version 13 (ordered since April 12, 2011) or have paid for an upgrade since that time. It is not a free upgrade for users who originally ordered version 12 or below. Users of older versions can upgrade for $11.95 at http://www.goodsol.com/upgrade.html . The quick way to determine whether you need to upgrade to use version 14.5 is to look at your registration code. If your registration code starts with "43", "42", "2a", "2r", or "2g", the upgrade is free and your registration code will work in version 14. If your code worked in version 14.0 thru 14.4, it will work in version 14.5. 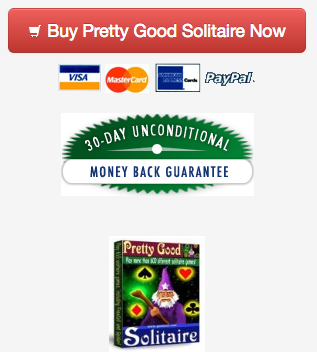 Pretty Good Solitaire is US$24.95 for immediate electronic delivery. If you want an additional CD, there is an option to add $9.95 shipping. Remember that we have bonus downloads (the Cat and Dog Card Sets) and special discounts for newsletter subscribers to Pretty Good MahJongg and Action Solitaire at http://www.goodsol.com/subscribed.html . Apple released Mac OS X 10.10 (Yosemite) yesterday. Our Mac games work fine with Yosemite, especially the newest versions. Pretty Good Solitaire v3 for Mac was released last month. It will work on the new Yosemite. It has been updated with some bug fixes to version 3.02. If you have the full version, just go to the Internet menu, select 'Download Latest Version' to download the latest update. 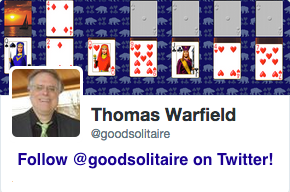 The Mac AppStore version of Pretty Good Solitaire has also updated to version 3, it can be updated in the AppStore. This game is at Forty Four Thieves.